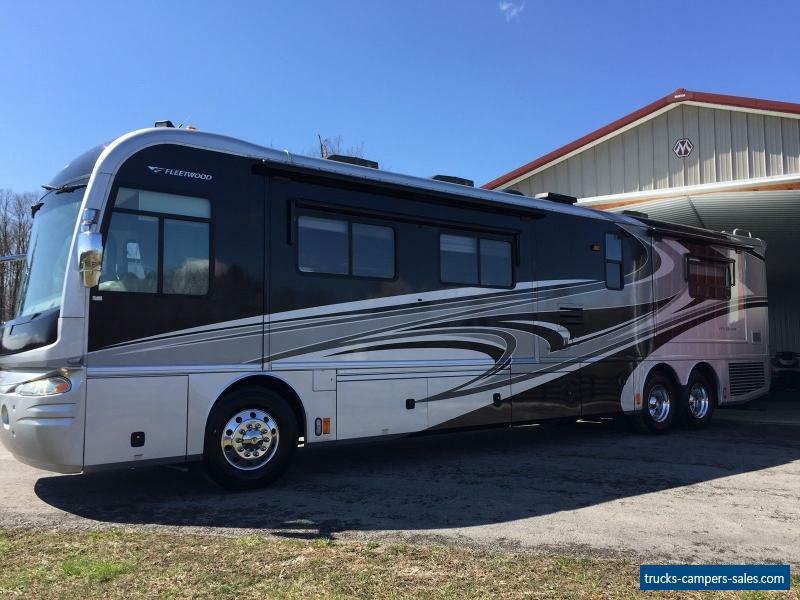 THIS 2007 FLEETWOOD REVOLUTION LE, BY AMERICAN COACH. THIS IS THE FOUR SLIDE MODEL, SITS ON THE SPARTAN CHASSIS, IS 43 FEET IN LENGTH, HAS FULL BODY PAINT (SILVER/GREY/BLACK), AND IS POWERED BY THE 400HP CAT C9 AND THE ALLISON TRANSMISSION. HAS BEEN GARAGE KEPT SINCE PURCHASE. EXTERIOR BASEMENT ENTERTAINMENT (TV, RADIO, CD), ONE HALF SLIDE TRAYS, 2000 WATT MAGNUM INVERTER, 12 VOLT BATTERIES, 10 GAL DSI HOT WATER, 150 GAL FRESH WATER, 90 GAL GREY BLACK WATER, REAR ROOF LADDER, REAR HITCH (10,000 LB TOWING), WINDOW AWNINGS, 38 GAL PROPANE, ROOF MOUNTED A/C'S, 7500 ONAN DIESEL GENERATOR, 22 FOOT ELECTRIC PATIO AWNING, ELECTRIC DOOR AWNING. 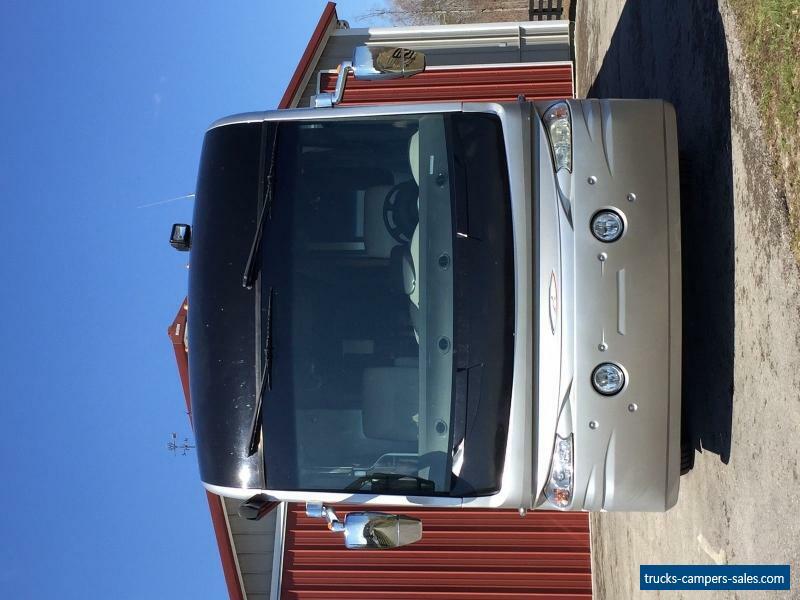 DRIVING COMPARTMENT EX BRAKE, PEDAL ADJUSTMENT, AUTO GEN START, AUTO HYDRAULIC LEVELING, ELECTRIC FANS, ELECTRIC SUN SCREENS, BRAKE CONTROLLER, 12 VOLT OUTLETS, DR PASS POWER ADJUSTED SEATS, PASS FOOT REST, REAR SIDE VIEW CAMERA, AND FRONT WINDSHIELD CURTAIN. ENTERTAINMENT IN MOTION SATELLITE, 27 IN FLAT SCREEN TV, RADIO CD PLAYER, AND SURROUND SOUND. LIVING AREA CERAMIC TILE FLOORING,JACK KNIFE SOFA, HIDE BED SOFA, LG PICTURE STORM WINDOWS, DAY NIGHT SHADES, DUCTED A/C, FORCED AIR HEATING, AND CENTRAL VACUUM. 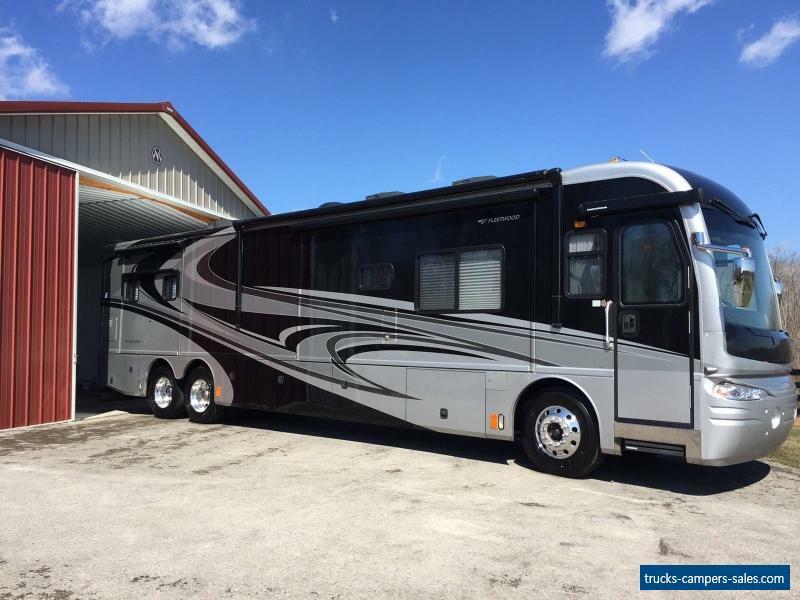 GALLEY TABLE CHAIRS, EXTENSIVE SOLID SURFACE COUNTERS, RAIN SENSOR CEILING VENT, DUCTED A/C, FORCED AIR HEATING, CERAMIC TILE FLOORING, 4DR REFRIGERATOR WITH ICE MAKER, ICE WATER DISPENSOR, AND WATER PURIFIER DISPENSOR. BATH WALK IN SHOWER, RAIN SENSOR CEILING VENT, CABINET WITH SOLID SURFACE COUNTERS AND WASH BASIN, MEDICINE CABINET. BEDROOM WALK AROUND KING BED WITH SLEEP NUMBER MATTRESS, LARGE CEDAR LINED CLOSETS, BEAUTIFUL CABINETS, DRAWERS STORAGE AREAS, 21 INCH TV. ITS IN GREAT CONDITIONPlease call 606-521-1057 ask for Tim!